This lakefront compound on the south shore of Lake Huntington offers immediate access to the lake from the lawn – and even has its own boat ramp. 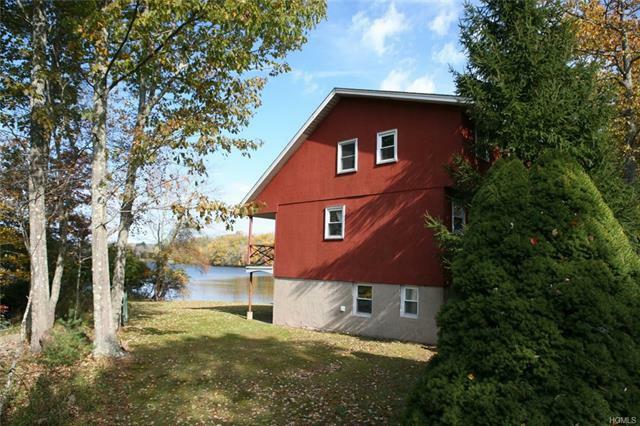 The property is bounded by a lovely stream, the outflow of the lake that feeds the Ten Mile River. The first floor features open public areas: kitchen, dining area, living room, as well as a bedroom and full bath – plus access to a covered balcony overlooking the lake. The second floor has three bedrooms off a balcony. A lower level has a spacious family room, den, half-bath, laundry, and walk-out access to the back yard and lake. Recent upgrades include new roof, well pump, furnace, hot-water heater. Drilled well, municipal sewer. The 25’x35’ garage is insulated, heated and plumbed, with a spacious workshop and carport. The grounds of this property are level and park-like. It has never flooded. If you’re looking for an efficient, well-kept lakefront as a getaway or an income-producing vacation rental, you should check this one out.